Flooding in Metarie, Louisiana, following Hurricane Katrina. The photo was taken September 8, 2005. The Hurricane had made landfall nine days earlier, on August 29. The catastrophic scale of the damage was due, in part, to the scale of the storm, and, in part, to the manner in which the various governments involved managed risk and risk resistance. Dr. Walter Maestri, Emergency Management Consultant with DRC Group, was for over a decade the Director of Emergency Management for Jefferson Parish, Louisiana, of which Metarie is a part. Dr. Maestri held that position through the events associated with Hurricane Katrina. In a 2005 interview with the PBS program FRONTLINE, and on numerous other occasions including congressional testimony, Dr. Maestri told of funds promised but not allocated and mitigation plans revised or deferred. He is quoted as saying, "pay me now or pay me later. You're going to pay now, the estimates are more than $160 billion to rebuild this community. If you had pre-positioned all of the resources that needed to be here, if you had raised the levees or begun that process or looked at some of these other out-of-the-box ideas, it wouldn't have cost $160 billion, and we wouldn't have lost as much as we have." In response, government officials have argued that even if those plans had been executed, the catastrophe would not have been prevented, because the scale of the storm exceeded the design capacity of the mitigations. However, such a claim only indicts as inadequate the planned — but deferred — mitigations. Photo courtesy U.S. National Oceanic and Atmospheric Administration. Risk resistance is the objection to all or part of a risk plan's content. Typically, objectors are project sponsors or senior managers. Typical objections are that the risks in question are fictitious, or that the mitigation plan is too expensive. Since the organizational power of the objectors generally exceeds that of the risk plan's authors, authors often simply eliminate or downgrade the items with which objectors disagree. Although risks rarely materialize as projected, something similar often does. A classic example is the flooding of New Orleans in 2005. Concerns about such catastrophes trace back at least to the Flood Control Act of 1965, but the resources provided over the years for mitigating flood risk were most inadequate. 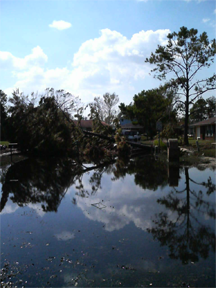 The result of these mitigation downgrades is the disaster following Hurricane Katrina. Downgrading risk plans — or their funding — doesn't downgrade the risk or make risk mitigation any cheaper. Instead, it opens gaps between risk plans and reality. That's how risk resistance creates risk. Here are four methods for addressing risk resistance risk. Document risk plan revision in a Risk Plan Revision History — a section of the project plan that documents the downgrading of risk probability estimates and risk mitigation budgets. Traceability facilitates corrective action when the organization is found unprepared for risks that do materialize. Record in the History the original risk plan elements, the reasoning supporting the modifications, and the dates of and parties to the downgrade decisions. After an unanticipated risk materializes, and its full impact on budget and schedule are known, review how it was addressed in the risk plan. Was the risk anticipated in the final plan? If not, was it addressed in any earlier versions of the risk plan? Were earlier versions of the plan downgraded? Use the Risk Plan Revision History to answer these questions. Keep accurate historical data measuring both the budget and actuals for risk response. a Risk Plan Revision Historyeffectively requires narrowing the gap between risk plan budgets and risk response expenditures. Rarely do we have the necessary data available when we try to assess our risk performance. Start collecting it now. Mitigating risk by taking actions that harm other projects can be expensive to the organization. Some projects use political power to export the costs of their risk responses onto other projects. For example, reassigning people with rare skills — or holding onto them longer than planned — might aid one project, but it can harm others. To assign responsibility for these costs correctly, measure risk response costs across the entire organization, as opposed to per-project. Would you like to see your comments posted here? rbrenNmmaWIRnpaYYMsNyner@ChaczaYRYLaLHAvzmzKcoCanyon.comSend me your comments by email, or by Web form. I offer email and telephone coaching at both corporate and individual rates. Contact Rick for details at rbrenJnqEzBVjuXufEUYtner@ChacgOsjmyptxYhOgwDNoCanyon.com or (650) 787-6475, or toll-free in the continental US at (866) 378-5470.